The building and construction of custom homes... A home and landscaping photo feature by Eager Web Page Design. Homes are built every day, but rarely do we have an opportunity to view pictures of the step-by-step process of home construction. 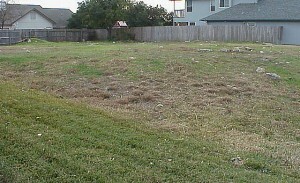 This Web site displays and describes photos of the home and landscaping taken during the construction of a custom home in San Antonio, Texas, from the vacant lot to the finished product. This is an in-depth, educational look at the process of constructing new homes and the hard work that is required. Read more or go directly to the Photo Gallery below. We welcome your comments and suggestions about this Web site or the actual building of the home. We appreciate all of the feedback we have received. If you would like to make a contribution to help support this site, please click here. The Building of a Custom Home Web Site was awarded the "Pure Gold" award from the Real Estate Library on January 22, 1999. The Building of a Custom Home Web Site was selected as an "Editor's Choice" Award winner by The Complete Real Estate Software Catalog® on October 5, 1999. The Building of a Custom Home Web Site was given the REALS Award on October 17, 1999 for offering a great contribution to the Real Estate Internet community. The Building of a Custom Home Web Site was given the Real Estate ABC Gold Award on March 25, 2000 for providing "advice or guidance to real estate consumers and also provides information about the local community." We were also featured in their 250 Most Visited Real Estate Web Sites starting on the week that ended March 25, 2000. The Building of a Custom Home Web Site has been featured in the list of Real Estate Pro's Top 100 Sites starting on March 29, 2000 (based on Web traffic). The Building of a Custom Home Web Site was rated "excellent" by the International Real Estate Digest in May 2000.